Thread: Can someone give me a pointer? Hello everybody. I would like your honest opinions. What should be the thing to improve? I would like to work out the lower parts of my back, any good methodes? I thank you guys for every reply! Welcome to the board bro, look great especially the chest. Need to bring up the arms a bit more, especially the biceps. How about a shot of your wheels. Nice upper back, do a lat spread and lets see how wide you are. Keep working hard and you'll get there as you have a solid base so far. Re: Can someone give me a pointer? Lower back can be built with deadlifts and hyper-extentions. I'll let one of the more experienced lifters on AR give you the best routine. Thanks! I've been watching this sites for a while, and I must say I am impressed by the kind people that are here! Many people to help you with your workout planning and so! Keep up the good work! I'll try to send some more pictures soon. what are your stats? and age. Hi. I have just turned 20. I'm 1.72 in height. 70 kg. Pardon my english. i'm from Norway! 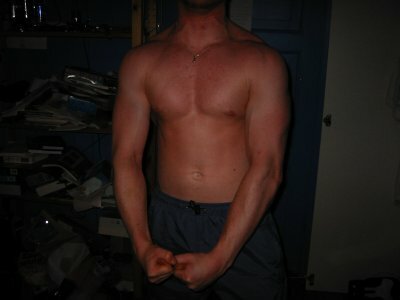 look good bro, if you ant a thicker back, do a lot of heavy compund exercises like cable and dumbell rows. Go heavy and with strict form, reach deep and pull deep. Pull ups help also. Isolate back workouts by them selfs, to concentrate on that muscle alone. Keep lifting hard bro! Hi Pi... pictures are a little dark, but I thought the back looked real good. Like the others have said, focus on compound heavy excercises to improve overall thickness. But, like I said... I thought the back looked good. However, agreeing with Cannes, the biceps need some work. Again, might be the lighting, but because of your long bicep heads, you need to improve overall thickness to bring em in line with the other parts. I'll let others with more experience make the suggestions. But I must say that you look great. Your hard work shows. With the inside bicep shot, you can definitely see the potential. Problem is that the heads are quite long, and Piron has his work cut out. When you scrunch up a long towel its gonna peak better than a short towel, no doubt. But, unfortunately, the arms hang to the sides most of the day. Gonna be tough, but he obviously knows how to train. I'm lucky to have short heads, so if there is anyone schooled in this area of how to improve the size of long heads, please chime in. Otherwise, I will stay with the true staple... lift heavy with barbell curls, low reps. Supplement with inclines, seated alternating, hammers, etc. And finally, if my observations are not valid, please advise. Thank you guys. Illbeast, 6-8 reps? I have trouble motivate myself to do the biceps workouts.. It is so much easyer to do the back or my neck. But as someone said, "no pain,no gain"! Would you guys suggest to work out only the biceps in one session? Not combine it with f.ex. my back? If it is easier to motivate yourself, you can plan a day dedicated to arms specifically. Pick a day and do biceps and triceps (another day for back, chest, shoulders and legs). I agree 100% with llbeastcd but also recommend bringing up your triceps...that way your overall arm development is that much more impressive. Last edited by Pete235; 03-14-2002 at 07:53 AM. Lol! Yes, thats true! How do know about them? I was a competitive flatwater sprint kayaker for years and still follow the sport religiously. For those who don't know Knut Holman, he won 2 Gold Medals at the summer Olympics in Sydney in the sport of Flatwater Kayak Sprint racing...the 500m event and the 1000m event. My best friend is on the Canadian National Team (and he is actually close friends with Knut...Knut's girlfriend is Carolyn Brunet of Canada..Oympic silver medalist in ladies K-1). Since my buddy spends months at a time in Europe during the summer months (World Cup Regattas) he hears all the top European music. If he likes it he downloads it when he gets home...including Morton Abels - "Hard to Stay Awake"
......so if there is anyone schooled in this area of how to improve the size of long heads, please chime in. Otherwise, I will stay with the true staple... lift heavy with barbell curls, low reps. Supplement with inclines, seated alternating, hammers, etc. to improve the peak, drop some weight off the bar and twist your wrists so that when you grip the SAME section of the bar, your little finger is HIGHER than your thumb! - this is REALLY odd at first and you have to lean into it and push your elbows closer together than normal. keep the weight low until you have the feel of this, since it pulls in places you are not used to working! after a while you can increase the weight slowly and you will find that you get an awsome pump especially if you can perform a contraction at the top of each rep.
i DONT know if this will work for anyone else but it works wonders for me! i dont do this every time i work arms as it seems to be less effective like that and my main staple is heavy barbell curls and hammers.